Nowadays consumers are so accustomed to a large amount of advertising information that they mainly do not respond to it. The strategy in which a person is pushed to purchase is fading. Native advertisement, unlike traditional display ads, works great, awakening a natural interest in the product. Augmented reality (AR) is an ideal tool for implementing viral advertising campaigns. AR creates an emotional connection between the user and the brand through interactivity and personalization. Therefore, you should pay attention to the use of augmented reality in advertising, if your marketing strategy is not aimed at a one-time purchase, but at building long-term relationships with customers. What is augmented reality advertising? Usually, when people talk about augmented reality advertising, they mean a mobile application, which uses a smartphone, or tablet camera to augment the real environment with some marketing content. Users have to install AR applications on their mobile devices to access augmented reality content. The augmented reality application should be useful, entertaining or edutaining to induce the customer to install it. Mobile platforms are currently the most popular way of distribution for augmented reality advertising. But it’s not the only one. 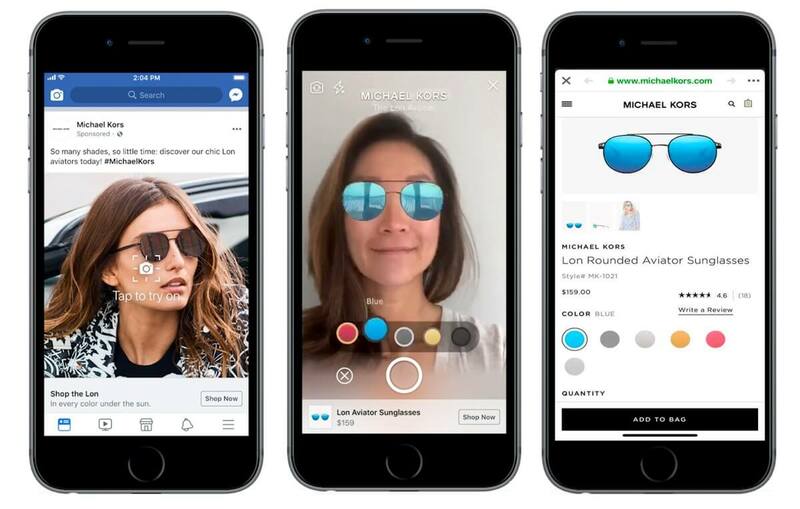 For example, now Facebook and Instagram together with major brands, including Michael Kors, Sephora, and Pottery Barn, are testing built-in AR advertising. Augmented reality ads will appear in users’ newsfeeds along with traditional advertising. AR ads in social networks will allow customers to examine the product instantly using the virtual try-on function. Also, there is a large screen augmented reality advertisement. It is generally broadcasted on the screens in crowded places, for example, at public transport stops or in shopping centers. Large screen augmented reality ads bring people from their everyday life to unusual environments, causing a strong emotional response and creating a sense of engagement with the brand. Interactivity and immersive effect of AR ads engage users emotionally. Thus augmented reality advertising can be much more effective than traditional advertising. Virtual try on with the help of augmented reality is an excellent opportunity to promote your product and provide value for the consumer as well. In the age of online trading, users will certainly appreciate the opportunity to try on a product they like instantly. Many major brands are already using virtual try on in their marketing campaigns. With the special mobile AR applications, you can try L’Oréal makeup, Ray-Ban glasses, Lacoste shoes, or even furnish your apartment with Ikea furniture. Advertising with augmented reality has proven its effectiveness. For example, L’Oréal boasted that the conversion rate among users of their mobile AR beauty app was 80%. Therefore, following large brands, smaller companies also resort to virtual try-on. A hyperlocal advertisement is an ad with a small coverage, designed for the target audience within a specific neighborhood. That is where AR technology certainly comes in handy. Rather than searching Google maps for nearby attractions, customers can open your AR app that will provide them with a route and other useful information. Generally, hyperlocal augmented reality applications use GPS data to provide customers with the most relevant information. Stella Artois with the mobile app Le Bar shows a great example of hyperlocal augmented reality advertising. The AR app helps its users to find the nearest bars selling Belgian pilsner. Consumers can quickly get to the destination point since the app provides them with the AR route. Thus, Le Bar app simultaneously benefits consumers and stimulates sales of Belgian beer. With the help of augmented reality, the package of your product can become a powerful marketing tool and even encourage post purchasing. 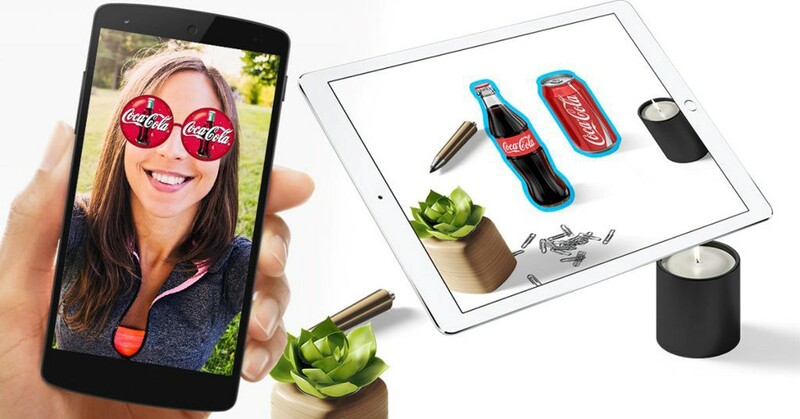 Connected packaging means that a user can “activate” the package and get access to various content with the appropriate augmented reality application on a mobile device. AR content may include useful textual information, a web page, an interactive video, or a game. Connected AR packaging can deliver additional utility to customers effectively creating loyalty to your brand. You can also add extra triggers to the AR advertising app that will encourage repeated purchases of your product. There are two types of AR advertising, depending on how users access advertising content. Let’s have a closer look at these types. Outdoor augmented reality advertising is broadcasted to a large audience and often does not require any direct actions from the user. However, outdoor augmented reality advertising is more effective than traditional outdoor advertising. So what is the secret of AR advertising efficiency? First of all, augmented reality advertising causes an emotional response by immersing the user in the content. The users feel involved in what is happening, even if they do not directly interact with the content, but only observe it. We can see this in the promo campaign of the AMC series – Walking Dead season 5. Augmented reality advertisement was broadcasted on the screens at bus stops. The AR video looked so real for the audience that they seriously felt like heroes of the post-apocalyptic series. Moreover, outdoor augmented reality advertising can seem personalized. Clothing brands successfully use this outdoor augmented reality advertising property, creating virtual fitting rooms right in store windows. This is what Timberland did in their storefront. Timberland created virtual fitting rooms where everyone could try on new clothes and save photos of their looks. Many customers were sharing these pictures on social media thus promoting the brand’s new collection. The capabilities for using mobile augmented reality advertising are almost unlimited, and now businesses are just starting to explore these possibilities. With a mobile AR application, you can track user GPS data and run effective hyperlocal augmented reality advertising. Using smart AR packaging, you can direct the customer to the shelves with your products in the store, and then encourage post purchasing. Virtual try-on will help to increase the conversion of your advertisements significantly. 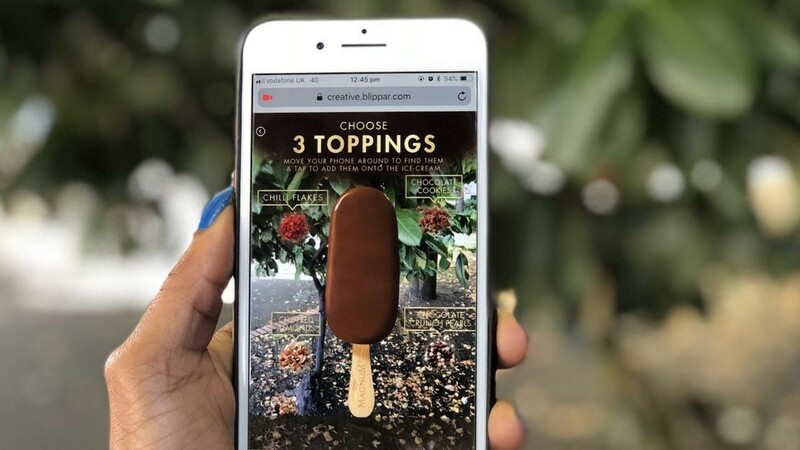 Mobile augmented reality advertising can captivate adults and create a powerful emotional connection with the brand through interactive content. You can also sell more kid products using bright augmented reality games and edutainment. Many brands have adopted augmented reality in their advertising campaigns. We have picked several examples that illustrate the potential of augmented reality for marketing. Coca-Cola is a marketing giant that creates one successful ad campaign after another. One of the best examples of such campaigns is AR advertising for the FIFA World Cup 2018. Coca-Cola has created interactive videos with a popular Swiss football player Xherdan Shaqiri. These videos were showcased on the large screens at the Zurich train station. Everyone could kick the ball and make a joint photo with the world football star. Naturally, participants actively shared their impressions and photos with the world football star in social networks. Coca-Cola FIFA World Cup 2018 campaign has become viral due to a combination of the popular event and extraordinary immersive experience. LEGO is one of the early adopters of augmented reality for advertising their products. Back in 2010, they used smart packaging and so-called augmented reality kiosks to show three-dimensional models of the assembled sets. In 2017, LEGO released their free AR Studio on the App Store. This AR application allows you to play with a digital version of LEGO sets in the real world. Lego also encourages customers to mix their own physical Lego sets with digital ones to create a unique game experience. In the application, users can take photos or create their videos of the gameplay. Using the AR Studio App LEGO non-intrusively advertises different game sets and creates an emotional connection between customers and the brand. Augmented reality does not only work well for commercial advertising, but also for conveying relevant information and drawing attention to social issues. 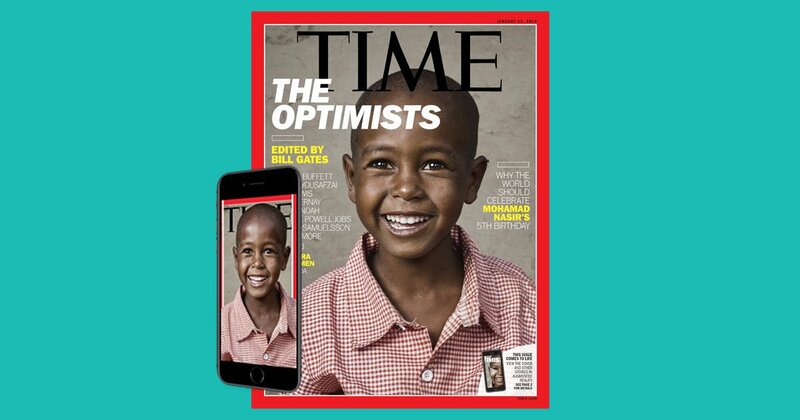 In January 2018, Time Magazine released its first issue using AR technology. In this issue, AR storytelling has been used to highlight social problems and generate an emotional response from readers. A specially designed mobile AR application responds to markers on the pages of a printed magazine. With the help of interactive infographics, video, and animation, Time has drawn attention to the issues of child mortality in Ethiopia, as well as the gap in education between men and women. There are many ways to create an augmented reality marketing campaign. When choosing a suitable method, we advise first to take into account the interests of your target audience, the available time, and your budget. Applications to augment smart packaging vary in their content. These applications can include text and graphics information, interactive videos, and even games. Time and cost of augmented reality development depend on the content and functionality that the AR application has to offer. If the application contains only additional information in text and graphic form it is relatively quick and easy to develop. The more graphics and animations you need the more complex, long, and expansive the development is. The packaging for children products is often augmented with games and interactive edutainment content. Development of such interactive applications with complex, detailed graphics may last longer and require more time for testing. Usually, the development of an AR application to complement smart packaging takes from a few months to half a year. Large screen augmented reality experiences don’t provide much interactivity. A small amount of interactive elements facilitates the development of the software for large screen AR applications. However, to create an immersive effect graphics for the large screen augmented reality should be detailed and realistic. The creation of high-quality graphics and animation for the large screen AR app takes long. The development of complex large screen augmented reality experience will take about two months. Augmented reality campaigns for printed media are widely used, ranging from the promotion of tourist routes and vehicles to drawing attention to social problems. An AR campaign for printed media generally means adding 3D animations or simple interactive videos to various magazines, brochures, and catalogs. Typically, it takes up to a few weeks to create an AR application for printed media. Therefore, AR advertisement should not be used for the topics that quickly lose their relevance. Interactivity and well-designed user experience are the essential elements of an excellent AR game. Involvement in the game is due to interesting gameplay. High-quality graphics will be an extra plus. 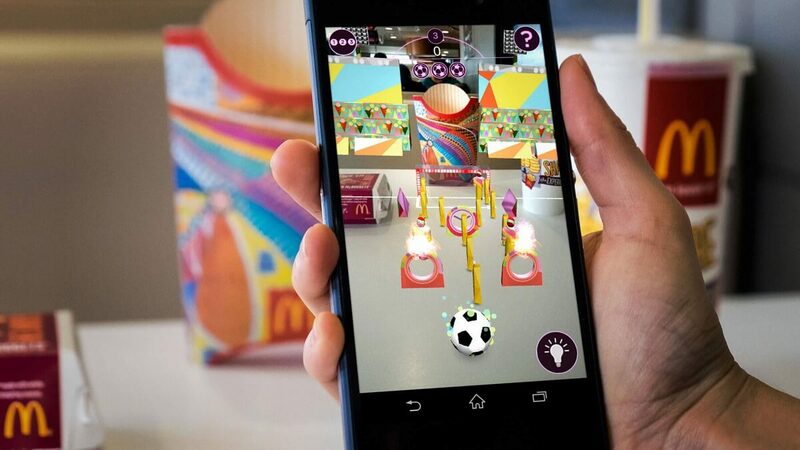 When developing an advertising augmented reality game, it is important not to get carried away with the idea of the game itself. The AR game has to show a clear connection with the brand, so the users easily understand what you are advertising. Usually, two months is enough for the augmented reality game development. What is the cost of augmented reality advertising? Typically, the augmented reality cost is based on the rate for a particular kind of work and the time spent on its implementation. These rates vary greatly from company to company. Yet the average hourly rate is $110-$170. The design includes the creation of the user interface (UI) and user experience (UX). It is necessary to convey an integral visual style of the brand with the AR app design. The programming phase includes front-end (client side) and back-end (server side) development. Most modern companies divide the AR development process into iterations. After each iteration, the client can evaluate what has already been done, what needs to be fixed and what functionality should be implemented next. Some companies neglect this important component. But it is necessary to understand that without proper testing; even the best ideas can fail. Therefore, we recommend you to include testing of the AR application in your budget. Marketing campaigns with augmented reality technology are becoming increasingly popular. Now the augmented reality app development cost is affordable for medium and small businesses. It must be admitted that augmented reality itself can’t attract clients. AR is just a helpful tool to increase the attractiveness of your offer and highlight you among competitors. If you want to promote your business using the advantages of augmented reality, we are willing to help you choose the best advertising format and develop an augmented reality app.